Hello and welcome to the Anniversary Amore Blog Hop! If you've come from Kim's blog then you are in the right place! If not and you would like to start at the beginning please click here. I am soooo excited to share with you the card I made for this hop! I used my FAVORITE stamp set of all time, Jaded Blossom "Cheesy Pick Ups". Sentiment says "Your lips look so lonely.. would they like to meet mine?" I used cricut cartridge Indie Art for the lips and Art Philosophy for the circle and scallop circle. I also used "Funny Mail" for the lips in the background. Thank you so much for checking out my project and this hop! To be eligible for the prizes you must comment on all blogs participating in the hop. Next stop on the hop is my good friend Jenny!! I just got this stamp set and I love what you did with that pick up line. Great job. Love the colors. That is so funny and perfect for these lips. They remind me of the Rolling Stones lips. Fun card! Love the sentiment! Now...those are some LIPS! I love this fun, bright, happy card! Great layers and inking and just fun! Love it! Love your fabulous card and the sentiment!! This card made my heart smile! I love little cheesy sentiments like that!! I just love your card. The pink and grey together are just perfect. Love the lips! What a cute card! tooo cute chickie love those big ol lips ! smooch! 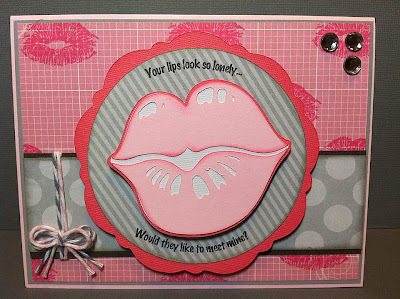 Those lips def look like they'd leave an impression haha I love the layering on this card! SWAK . . . .I just adore the lips on the background. Great card! love love love those lips!! Thanks for participating in my hop! I think that is so cute and well put together!